My 18 month old can already say “cookie” (well, it sounds more like keh-keh, but we know what he means). 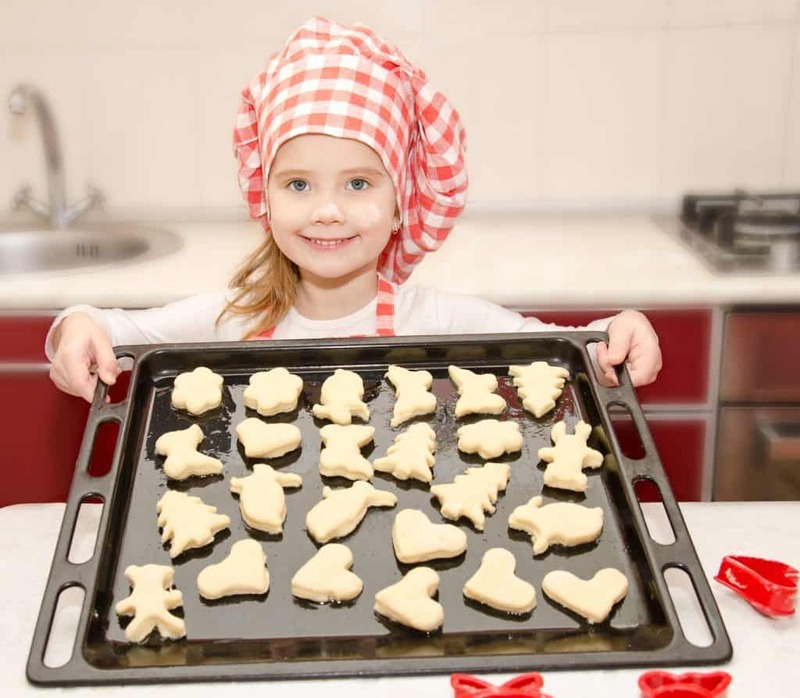 Baking cookies is one of my favorite ways to spend quality time with my kids that also results in a tasty treat. Nevertheless, my cookies sheets are terrible! If you’re just now ready to invest in some cookie sheets or need to replace old ones like I do, read on for some tips and suggestions. Feel free to skip right ahead to the recommendations by clicking the links in the table below, which will take you to the Amazon listings. Cookies sheets are one of those simple tools that nevertheless come in a lot of variety. Essentially what you need in a cookie sheet is a flat surface that heats up evenly to lightly brown the bottom and cook the inside of your cookies. Sounds simple, but here are some of the variations you’ll encounter when hunting for cookie sheets. Technically speaking, cookie sheets are a flat piece of metal with no rim and just a lip on one or two sides for grabbing so that the cookies can slide right off after baking. 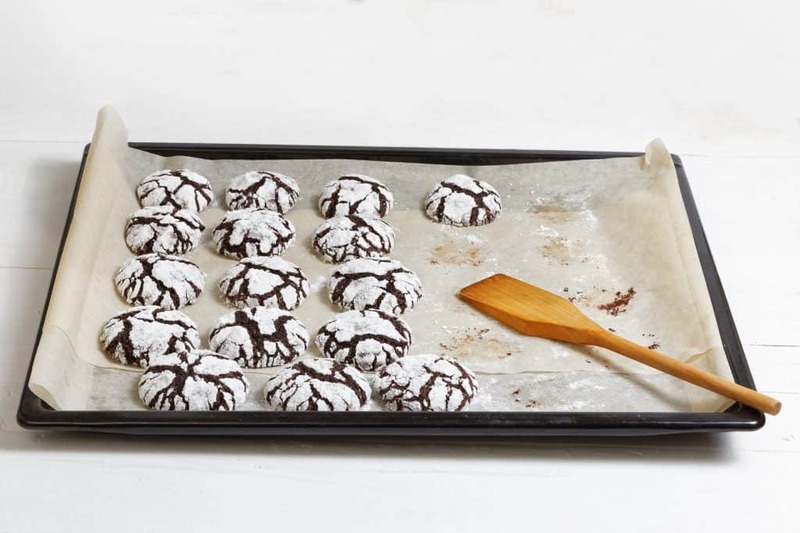 If you’re doing a lot of cookie baking specifically and have the space, you may like the clean look and ease of true rimless cookie sheets. But many people use baking pans with a short rolled rim on each side. If, like me, you have limited storage space and prefer to have multi-use items in your kitchen, you can use rimmed cookie sheets for tons of tasks. Dark pans brown the bottom of things more quickly than light pans do. This is useful when roasting vegetables or things that you want that hearty browning on, but potentially problematic for a delicate cookie like sugar cookies. You can manage this issue by lining the pans with parchment paper. Non-stick cookie sheets tend to be darker, so they cook things more quickly. While non-stick can be convenient, it does wear over time and must be treated carefully (no metal utensils). If you go with uncoated, you can always achieve non-stick by using something like a Silpat mat. Most cookie sheets are aluminum. You’ll want to find a heavy gauge, like 18/0, to provide the best conductivity and a pan that won’t easily warp. Some people have concern about aluminum’s safety, and while there’s not much scientific evidence to support the worry, there are alternatives. Here are some tips on pan cleaning! Air-filled pans are an interesting innovation on the basic cookie sheet. They consist of two pans stacked with a layer of air in between. This air pocket allows the top pan (where your cookies are) to remain a bit cooler, so that cookies crisp and brown without burning. Given all of these variations, let’s take a look at some different options that come highly recommended by bloggers and reviewers, and on cooking forums. Nordic Ware is an American company that still produces most of its wares in the USA. They make a number of different sizes of this baking pan. This sheet has rims on all four sides, so it can be used for a variety of oven tasks. The rims are rolled so there are no sharp edges. 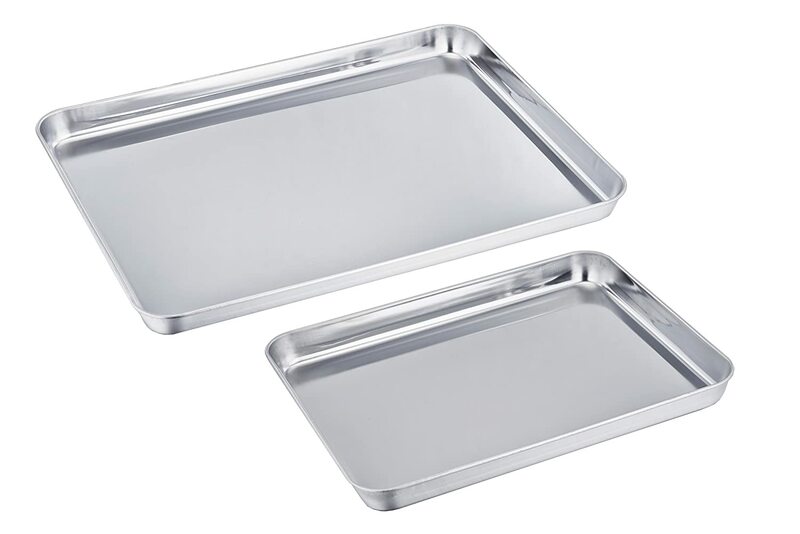 It’s made of a heavy-duty 18/0 gauge aluminum, so the pans have a bit of heft to them (for a cookie sheet—it’s still a pretty lightweight item). These sheets should be hand-washed. This is the cookie sheet that comes up time and time again on cooking forums and blogs. Reviewers note that the pan is simple but perfect—it is solidly constructed and will last for years, it cleans well, heats evenly, and turns out excellent cookies. Despite not being non-stick, most people don’t have an issue with sticking. The primary recurring complaint is that some people find their sheets have some leftover manufacturing oil of some type that appears after the first washing. This is a defect, so people who have contacted Nordic Ware with this issue have an easy time receiving a replacement. 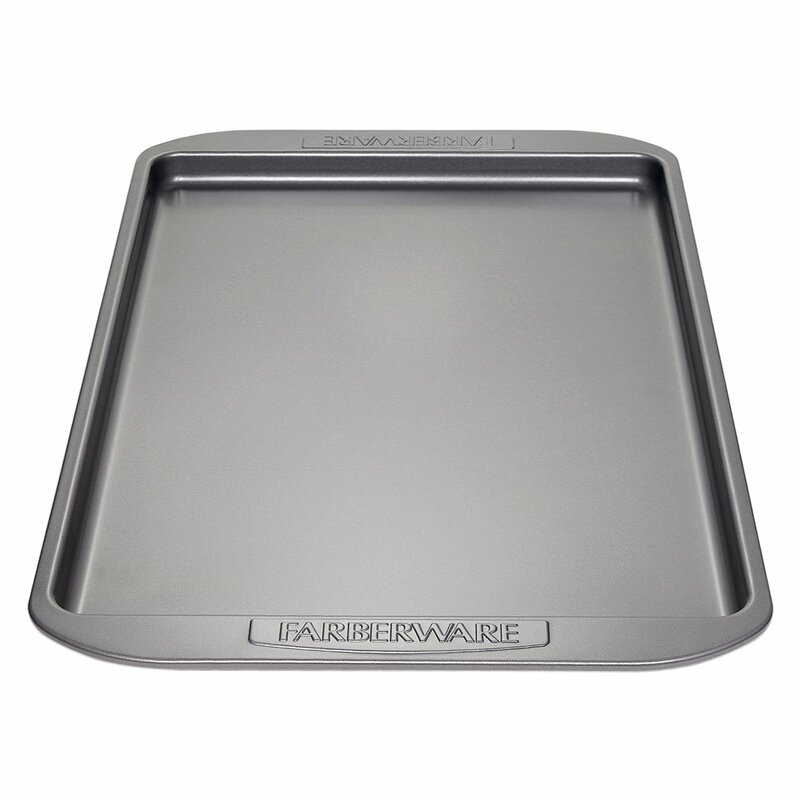 Farberware is another well-known line of cook and bakeware. The pans are the classic style of rimmed cookie sheets you typically see at the grocery store. These pans are constructed of carbon steel so they are heavier than cheap aluminum pans. Carbon steel can be prone to rusting, but the non-stick coating covers the pan so that this should not happen. Many people find this pan holds up very well. The non-stick surface makes for easy release from the pan, and many people find it is fairly easy to clean (this is important—I have another brand of non-stick pans, and they are stained beyond recognition!). Reviewers also like the wide handles on either side that make it easy to life and maneuver. The main drawback with the non-stick coating is that you must be careful to avoid scratching it as the carbon steel could rust underneath. Other reviewers find these pans warp, especially at high temperatures, although the description claims they’re good to 450ºF. While stainless steel isn’t the most efficient for baking pans, if you are concerned about aluminum or non-stick coatings, it’s probably the best alternative. This listing is for a set of 2 different sized pans. These pans have a smooth rolled edge to the 4 rims. The stainless steel is a heavy 18/0 gauge, although some reviewers note they don’t feel as heavy as a true commercial-grade pan would. Most reviewers really love these pans. Despite the usual concern over stainless having hotspots, most people find cookies bake evenly and brown nicely. The pans also clean well with a bit of care and sometimes some good elbow grease. The primary complaints are that the pans can warp at high temperatures, although they generally regain their shape when cool. One reviewer recommends letting the pans heat up with the oven as the gradual heating helps avoid the temperature shock that causes the buckling. AirBake bills itself as the original insulated cookware. This listing is for a natural aluminum pan not coated with non-stick substance, although non-stick pans are available as well. They make 3 different sizes and offer a 2 pack of this size, as well. These are a true dedicated cookie sheet. Without rims on the sides, you can’t roast vegetables or anything liquidy, but the rimless design makes it easy to slide the cookies right off. The air-filled insulated design also helps avoid burning and overtaking your cookies. Many reviewers love these cookie sheets and find that this is their secret for professional looking cookies. Bakers note that they’re especially good for shaped cookies so that even the thinner or narrow spots won’t brown more than the rest of the cookie. The primary drawback of this type of pan is that you must take care to avoid getting water in between the two sheets, as this will cause it warp in the oven when the water turns to steam. Therefore, careful cleaning and drying is necessary. 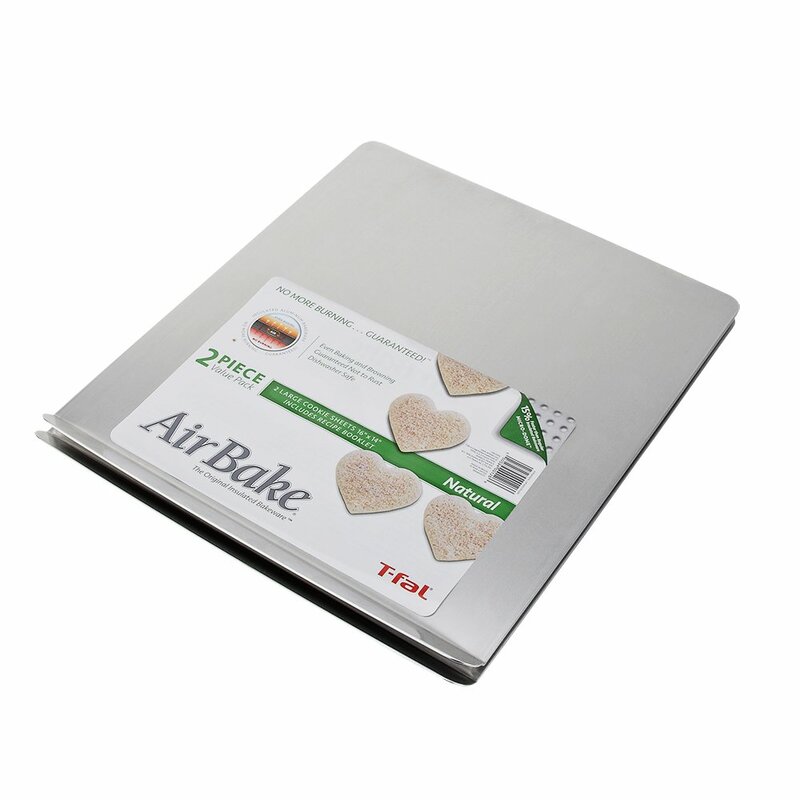 AirBake recommends cooking upside down in a low-temp oven to get their air out if some infiltration occurs. For something as simple as a cookie sheet, there are lots of great options! For a truly dedicated cookie sheet, the AirBake is definitely not a gimmick—the insulated construction really does pump out perfect cookies. 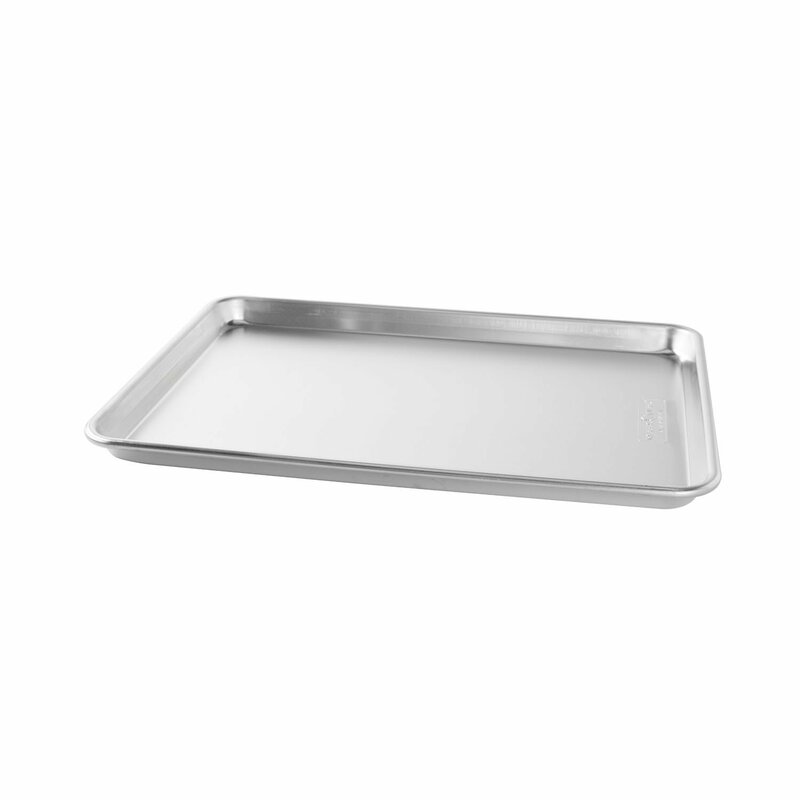 If you’re regularly making big batches of cookies for gifts and such, this is the cookie sheet! If you prefer non-stick, Farberware makes some of the best ones, although I don’t feel non-stick is necessary for cookies as they typically have enough fats to not stick. If you want a baking sheet that can perform multiple duties, there are great options with rims such as the highly recommended Nordic Ware aluminum pans. I think this will by my choice when I finally decide to replace my beat up cookie sheets! For something similar in stainless steel if you have concerns about the safety of aluminum, the Team Far stainless steel pair is a good option as well. Do you have a go-to cookie recipe? Share in the comments! This Is What Your Caviar Should Taste Like!